Dusk is a princess-sorceress from the long fallen land of Oolacile, where unique sorceries were crafted. At some point in the past, her home town was destroyed. It is unclear what caused the city to fall. At some point after this, she was trapped in a Golden Crystal Golem. Since the Crystal Golems are the results of Seath the Scaleless' experiments, it is likely that he is responsible for Dusk's imprisonment. In the additional content, we get to see how her city was destroyed. During Dusk's time, Oolacile awakened Manus, Father of the Abyss at the urging of a Primordial Serpent. Manus then proceeded to spread the Abyss across the land and captured Dusk from the present time. The Knight Artorias, who arrived in Oolacile to repel the Abyssal forces, attempted to rescue her, but he was overwhelmed and became corrupted by the Abyss. 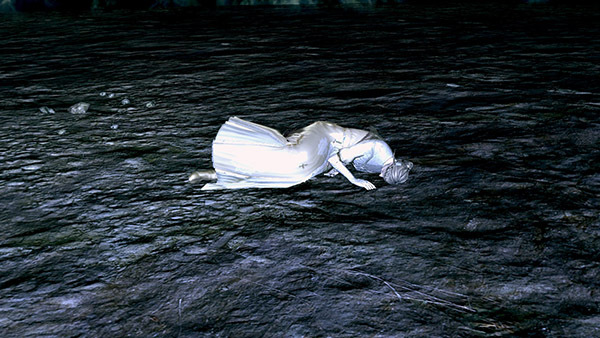 She is finally rescued by the player after defeating Manus, although mentally scarred and incoherent from her experience. 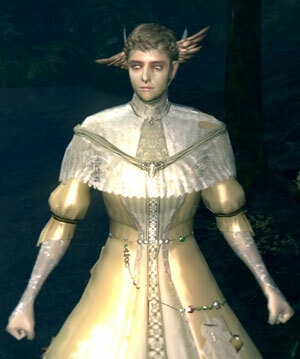 If you visit her in the Darkroot Basin after defeating him, she mentions being captured and being subsequently rescued by "Artorias", and having little memory of the event. She then realizes that your character was the one who rescued her, and not Artorias as she previously believed. Her summon sign is right at the edge of the lake where the Hydra was located, a few feet away from the corpse holding the Knight Set, but only after killing the Hydra and defeating the Golden Crystal Golem she is captured in. Right after you defeated the boss, she will appear where the boss is killed. You can only speak to her, and when you leave the area, she will be back in Darkroot Basin. Sells various utility sorceries after you rescue her. 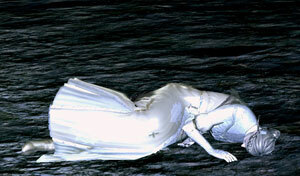 Saving her is one of the prerequisite to accessing the additional content (see also here). Kill the Hydra in the Darkroot Basin. This will spawn a Golden Crystal Golem in the alcove behind the Hydra. Travel along the lake by the waterfall all the way back to the alcove. Since you will be walking through water, it is recommended to equip the Rusted Iron Ring during this section. You should see the Golden Crystal Golem. If you don't see the Golem, try quitting and reloading. Defeat the golem. During its death animation, Dusk will appear where it was standing. Dusk will thank you for freeing her and asks you if you need her magic. Answer "Yes" and she will tell you that you can summon her to buy magic spells from her. If you answer "No" she will disappear and not be available for the rest of that playthrough. Now you can summon her via her summon sign.1 For some reason, it may occur that her summon sign will not be visible. It will, however, still be present in the water at the edge of the lake near the boulder, and it can be activated by moving around the area until the context menu for summoning her appears. After being summoned for the first time, the Antiquated armor set can be found near where you fought the Golden Crystal Golem. Despite being summoned via a phantom sign, she can in fact be killed. If you have the Additional Content, after getting the Broken Pendant, her summon sign will disappear until you have defeated Manus. The spells and catalyst she sells from that point are transferred, and shared, with Elizabeth. You don't need to be in human form to summon her after saving her. So, it is thou who rescueth me? Most graciuous. I am deeply obliged. I am Dusk of Oolacile. I cometh from an age long before thine… I can not stay here for long. So, before i disappear, allow me to ask one thing. My home, Oolacile, is the home of ancient sorceries. My hope is to pass this profound knowledge to thee, with thine approval. Would this be of assistance to thee? My heartfelt thanks. I am pleased beyond words. Then, I shalt engrave my signature. If you art in need, pray summon me from my signature. It seems that my time is done. May the great flame guide thee. Yes, of course… I understand well. Pray forgive me. I have overstepped my boundaries. Farewell; another age, another land, beckons me to return. May the flames guide thee. It is an honour to see thee again. I shall follow thine wishes. For a very long time, I was trapped within the Crystal Golem. From my home I was taken, and banish'd to a plane of distortion. It was there, that thou came to my rescue. Long after I had relinquished all hope. So gleeful was I, my faith reneweth. The sorceries of Oolacile differ from the magic of thine age. Oolacile sorceries are, what doth one say? They are somewhat… of an approximation. Thine sorceries are more straight forward, negating all but thy self. Dost thou not find some fascination in these discrepancies? My home of Oolacile was reduced to ashes, long ago, in my time. Long ago, in my homeland of Oolacile, I was beset by a creature of the Abyss. I would have perished then, were it not for the great knight Artorias. In truth, I saw little of what transpired, for mine senses were already fled! …That quite perfectly fits your semblance. Oh, dear me. That was Oolacile, many centuries ago. Please excuse my fanciful musings. Excuse me for such whimsical utterances. Perhaps it is the nature of true greatness. Oh, please forgive my ramblings. It's just that, I wish to know the truth. And no one, not even loving Elizabeth, will tell me. If thou art in need, pray summon me again. 1. Unlike most summon signs, human form is not required for using this one.